The number of new listings entering the market is still comparable to last year's data, but those levels have increased beyond normal sales activity. Higher inventory levels are the main culprit for this occurrence. Elevated inventories in relation to sales were the cause of the seven-month supply rising. Conditions that pointed to a buyer-dominated market have continued to impact prices. Residential prices citywide lowered to $414,800 during the month of January. This is nearly one per cent lower than December figures, and finishes at 4 per cent below levels seen exactly one year ago. Detached sales saw an easement by 17 per cent compared to 2018. Not all districts experienced the severe decline, as sales activity saw improvement in both the North West and North East districts. Declines that were the most significant occurred in the West and North districts of the city. New listings rose across all districts except the North East, South East and North districts. Only the North East district recorded months of easing supply as compared to 2018. 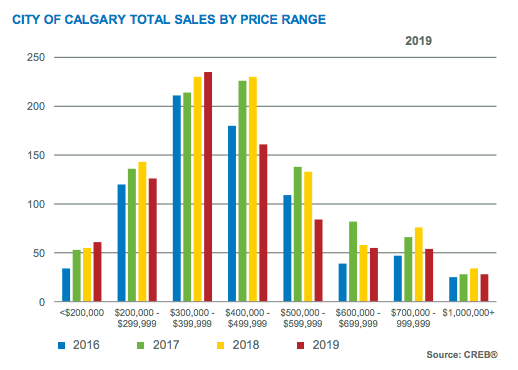 Prices of detached benchmarks sat at a total of $476,500, a one per cent decline compared to 2018. Every district experienced prices easing. 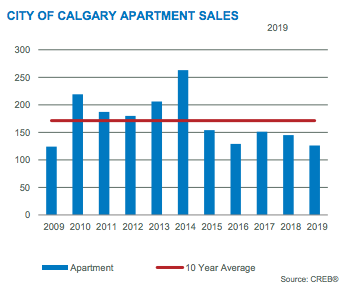 The largest year-over-year declines were noted in the North West, South, and City Centre districts. Apartment sales were at a total of 126 units during January. This is 13 percent below last year, and over 20 per cent below monthly long-term averages. Inventory levels as a whole have eased, with lower new listings and sales slowing to blame. There are currently 1,173 units existing in overall inventory, which tallies at nine per cent lower than levels seen during January of last year. Even after experiencing some adjustments overall in inventory, prices were absolutely impacted by months of supply remaining elevated at nine months. Compared to last month, prices were flat, declining overall by two per cent compared to levels seen last January. At this time, prices remain well below highs experienced previously, with notable improvement compared to last year in both the South East and North East districts. Sales definitely experienced a decline for both semi-detached and row product types. New listings were on the rise, causing inventories to rise for both product types. Buyer's market conditions are making themselves evident in the attached sector, with prices easing by over 4 per cent to reflect a January benchmark price of $313,700. 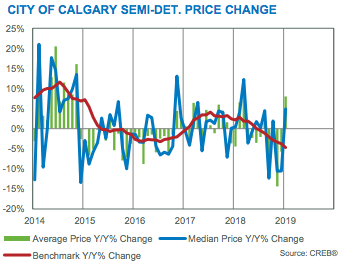 Semi-detached prices experienced a lowering by nearly five per cent compared to last year, seeing a total of $393,100. Areas where the decline was steepest were reflected in the South districts and City Centre, reflecting overall adjustments of six per cent. Prices experienced a decline of four per cent compared to last year, for a total of $284,300. Every district recorded price declines, but City Centre is where the largest took place: prices here are sitting at nearly 8 per cent lower than last year. During the past month of January 2019, the overall total of sales sat at 65 units. This is situated just below levels notated last year, but still comparable to the average activity that occurred over the course of the past decade. 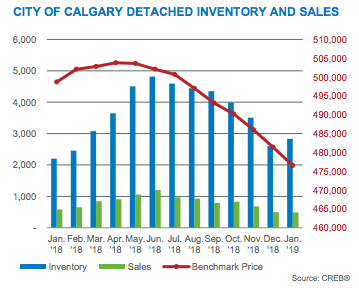 There was a noticeable increase in inventory levels to a total of 422 units here in Airdrie, and higher inventory overall has kept months of supply to be fairly high at 6.5 month. The main factor that is weighing on prices is a high level of supply that is persistent. During January, prices of detached units sat at a total of $354,300, which is .5 per cent below last month's price, and nearly five per cent lower than where sales figures sat during January 2018. January sales activity remained slowed compared to last year, mainly due to a slowing in Row sales. New listings eased a bit, causing a modest gain in inventory, and the ever-important months of supply to rise to nearly 14 months. An overall snapshot of the market determines that the oversupply has caused prices to ease down, as opposed to last month's data. When looking at a year-over-year basis, the detached benchmark price of $408,600 possesses a trait of stability when held up against price levels seen during January 2018. During the month of January, sales activity declined overall compared to last year. New listings in the market were at a decline as well, and more new listings than sales activity resulted in rising inventories. Here in Okotoks, months of supply now remains at above the 10-month mark. Oversupply has remained quite an issue, and weighs on benchmark prices with the 3rd month in a row experiencing decline. $416,900 was the total of detached home prices during the month of January, staying situated at one per cent lower than last month, and 3 per cent lower than it was at this time last year.